In 1671 cartographer and bookseller, John Ogilby, published America, being an accurate description of the New World. Ogilby’s book was in fact an English translation of a monumental work on North and South America by Dutch writer Montanus with the addition of some new text, principally on British America. Ogilby’s America was lavishly illustrated with plates and maps by Jacob van Meurs, the Amsterdam engraver who had published and illustrated the original Dutch version and who lent Ogilby his copper plates. 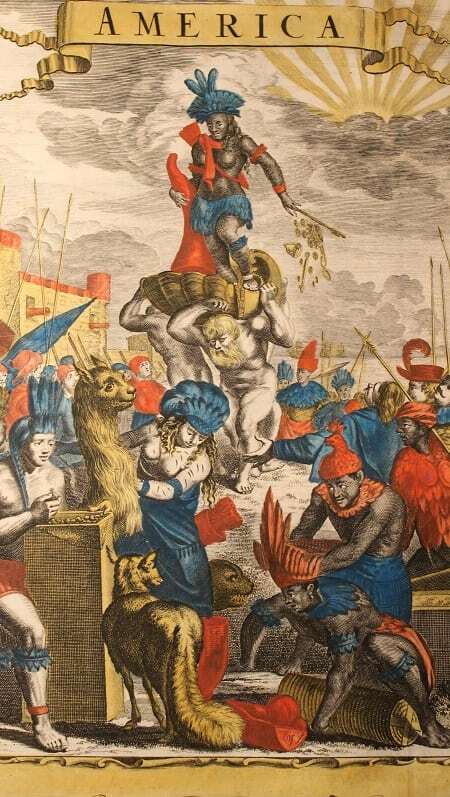 In the 1671 edition held in the Chapter Library [SGC RBK O.8] these wonderful engravings have been hand-coloured. Despite claiming to be ‘an accurate description of the New World’, the work contains many errors and includes numerous fanciful tales about the people and animals of the Americas. Since neither Arnoldus Montanus (1625?-83) nor John Ogilby (1600-1676) had visited the New World they were reliant on travellers’ accounts and secondary sources. Nevertheless, the book was well received and widely read by a European audience fascinated by the New World. It became a highly influential work. Despite its shortcomings, it continues to be a valuable source of information about the plants and animals living in the Americas at that time, including marsupials and llamas, and how they were perceived by 17th century travellers. The plans of the cities and ports are also of considerable interest, even if not necessarily reliable. The work also provides an illustrated account of the arrival of the Native Americans (assuming that they came from elsewhere) and the exploration and conquest of the New World by the Europeans, commencing with Christopher Columbus. 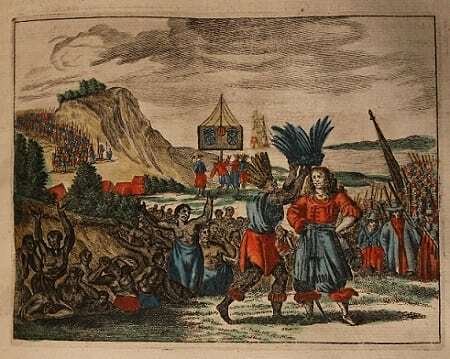 In this engraving, Sir Francis Drake is shown being welcomed by the inhabitants of Virginia. John Ogliby is better known for two of his other publications – The Fables of Aesop (first published in 1651) and Britannia (1675), the first British road atlas which set the standard for road maps for many years to come. His translations of Latin literature, including Homer’s Iliad, and of Montanus’ De Nieuwe en onbekende Weereld from the Dutch confirm his skills as a linguist and demonstrate his enterprise as a publisher. He had published an earlier version of this book the previous year under a different title:The New and Unknown World.